theAd>> Colorful phone features, animated movement, 30 second sound chip and light effect triggered by incoming call. Red character will move from side to side, Green, Yellow and Blue will rise from the film cans and bow to the audience. 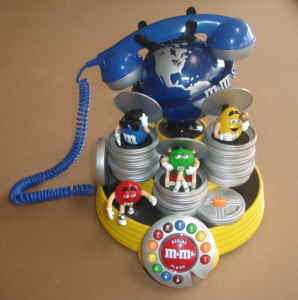 Light in the globe will light up and the "M&M's" STUDIO disc will rotate clockwise. Great news! Spend $25 and you will never have to buy acid again. It's more than a phone, it's an investment.